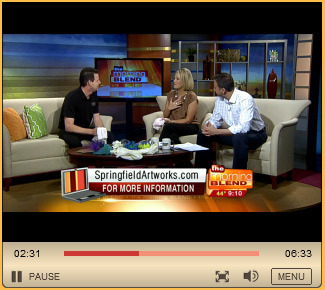 Photo of Alan Trembley's appearance on The Morning Blend Show, Omaha, April 25, 2013. Exciting and fun events can be had at Springfield Artworks including trunk shows, themed events, artist openings and special holiday happenings. Owners Glenn and Margie Trembley have added several new workshops and events at the gallery/studio. Platte River Christmas is celebrated in November and December. Glenn has recently participated in a Master Class on Whidbey Island in Washington state, studying with Richard LaLonde. He has taken several classes with Mr. LaLonde at his studio. He has studied with author and instructor Brad Walker in North Carolina at his studio on numerous occasions. The workshops were on glass fusion, working primarily with glass frit, powder and silver leaf, metal mold making, glass forming and crackled glass. He also studied glass etching with Norm and Ruth Dobbins in their studio in Santa Fe. Stop in to see the latest class offerings. Margie participated in the Midwest Felting Symposium in Madison, WI, where she studied hat making with instructor and author Margo Duke and advanced felt making with instructor Pam MacGregor, an award-winning felt designer. She also attended the Creative Felt Gathering and studied with Elis Vermullen of the Netherlands and Jone Rakoski from Michigan. Recently she studied various millinery techniques with Laura Hubka from Chicago and Lady Linda Crawford from Centerville, OH. The Trembley's have added bold colorful paintings, one-of-a-kind wearable art, graphite portraits, pottery, photography, and additional jewelry to their list of offerings. For your convenience, they also carry felting supplies, including the most sought-after tools from Europe! The Gallery is featuring new events each season. They were selected to participate in the Nebraska Tourism Passport program in 2013. Experience a good time with your family or friends at the Omaha area's most unique gallery and studio space. It's the perfect place to have events, a girls day or weekend out, mancations, or just plain shop, shop, shop. Experience a good time with your family or friends at the Omaha area's most unique gallery and studio space. It's the perfect place to have events, girls day or weekend out, mancation, or just plain shop, shop, shop.